Sawt el Atlas (Arabic: صوت الأطلس, Voice of the Atlas) is a Moroccan-French raï band coming from Blois (France) and based in Paris. Members are the three Mirghani brothers and the three El Habchi brothers, all of whom are immigrants from Morocco. 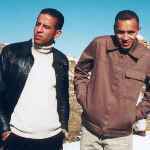 Sawt El Atlas started to hit the road in the nineties when they were just 12, and since then have played at many festivals in France, Holland and Germany and they have supported a number of major artists on tour. In 1996, after more than 200 gigs, they released their first CD, entitled Généraliser (Generalising), produced by Daniel Jamet former member of Mano Negra. It was a lively album swept along by its Arabic-French lyrics, which were deliberately positive even when they attacked the precarious nature of everyday social integration.